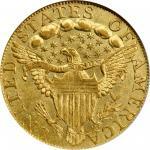 1797/5带帽半身像半鹰金币 NGC MS 611797/5 Capped Bust Right Half Eagle. Heraldic Eagle. BD-7. Rarity-6+. MS-61 (NGC). 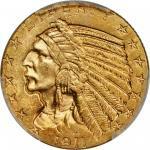 A monumental rarity in the U.S. early gold series offering both numismatic significance and superior quality. The overdate seen on this variety is one of the boldest in the entire realm of American coinage, easily as plain as the 1942/1-D dime, 1918/7-D nickel, 1918/7-S quarter, and other well-known but comparatively common overdates. The 5 underdigit has not been effaced at all, though the flag of the 7 lines up precisely enough with the flag of the 5 to mask it. Well struck with bold definition to all but Libertys central curls, which are a trifle soft as is typical. The reverse is a delight to study with considerable mirror finish in the field illustrating a complex network of die cracks. 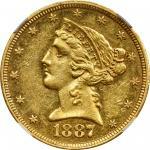 Struck on a bright yellow gold planchet with a dash of deeper orange-gold on Libertys uppermost curls, more uniformly bright and reflective on the reverse. Smooth and pleasing surfaces overall. A representative of BD Die State b/d, where the obverse die was lapped prior to striking this coin, with no further signs of clashing or cracks. The reverse was shattered yet retained the ability to strike up the devices rather well. 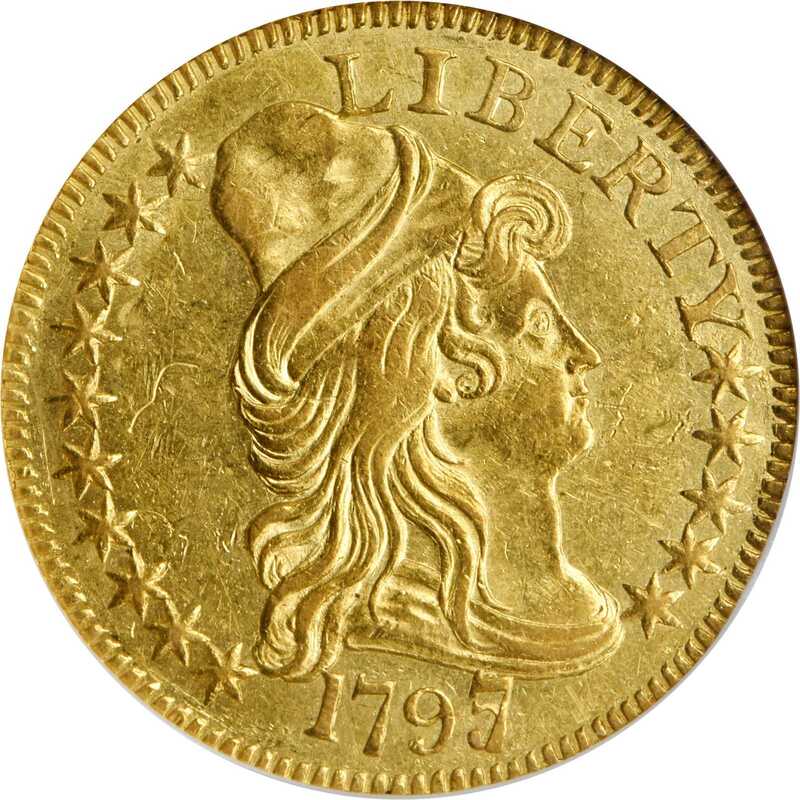 pThree die varieties of 1797 half eagle are known with the Heraldic Eagle reverse, and the BD-7 is the only one that is not unique. The other two known are each unique with both specimens in the National Numismatic Collection in the Smithsonian Institution. pOf the 500-1000 coins struck from these dies just 15-20 coins survive. David Akers posited that 12 to 15 specimens were known when writing in 1988, while Dannreuther more recently suggested 16 to 20 in 2006. This example ranks among the very finest known, ranked behind only the MS-62+ (PCGS) Carter-Pogue specimen and numerically tied with the MS-61 (NGC) Hilt example and the MS-61 (PCGS) coin in Superiors sale of August 2004, lot 978. To date, both NGC and PCGS record only 10 grading events for this rare issue between the two services, with some duplication likely in those numbers. The 1797/5 $5, BD-7 is one of the most challenging issues for a specialist to obtain, and the present example is one of the most desirable specimens extant.Ex our (Stacks) Public Auction Sale of October 1991, lot 938; our sale of the Dr. James A. Ferrendelli Collection, August 2014, lot 11062.